Chairman of Gurugram Haryana Real Estate Regulatory Authority (HARERA) K K Khandelwal has made it clear that in projects where construction is 40 percent complete, refund may not be allowed to ensure that the project is completed. He has also said that real estate developers who procured occupation certificates fraudulently will be taken to task. The purpose of RERA is to balance the interests and protect the rights of the key stakeholders – builders, buyers and agents. “But our first priority is to ensure that home buyers get possession of their homes,” said Khandelwal, adding that 66 percent projects have been completed in Gurugram (with minor differences) even after 20 to 25 percent delay. He also reiterated that realty projects come under the ambit of RERA Act even if occupation certificate has been received before July 28, 2017. “Nowhere does RERA 2016 Act mention that it is applicable only for registered projects. If a buyer finds defects in the structure of a completed unit, he can still approach RERA for redressal,” he said. If construction over 40 percent, no refund may be permitted? Haryana RERA has taken few steps that are favourable to builders as well as allottees. Where construction is 40 percent complete, we are not allowing refund as a matter of policy. If you refund one person, there will be 10 more asking for refund. If refunds are allowed, other homebuyers invested in the project will suffer and the project will never see the light of day. To protect the interest of one person, you are jeopardizing interests of scores of others. We have, therefore, decided to take a balanced approach to ensure that projects are completed. To complete projects on time we are not blindly or mechanically allowing refund except in rarest of rare cases. This is a real estate growth friendly step that we have taken. Those real estate developers who had tried to procure occupation certificates by fraudulent means will face action. Fraudulent OCs will all be cancelled and action will also be taken against errant officials. Only 33 projects registered on Haryana RERA website? This is because the website is not fully operational yet. We are still in the process of uploading old data. It will take another 15 days for all projects to be uploaded. If buyers do not get delivery of their homes as per the builder-buyer agreement, they can either claim penal interest or seek refund from the real estate developers with interest. Most anomalies to do with the rate at which interest penalty has to be paid to buyers have been addressed by Haryana RERA. Earlier, if the buyer was late in making payments to the developer, he would be charged penalty at the rate of 18 to 24 percent but if the builder did not had over possession in time, he was liable to pay penalty at the rate of Rs 5 or Rs 10 per sq ft. The RERA Act clearly defines that interest that is payable by the allottee to the promoter or vice versa will be the same. Also, it is payable by the developer from the day he has taken money from the buyer. Similarly in case of delay, if buyers decide to stay invested in a project, they would be given interest at the prescribed rate for every month of delay. The prescribed rate varies from 10.15 per cent to 10.45 percent. Also, if buyers have suffered mental harassment, quantifiable losses, they can file a separate case for compensation. What about mechanism to rope in realty bodies to complete unfinished projects? 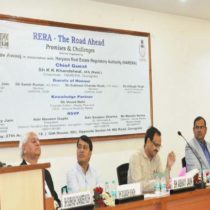 Haryana RERA is in the process of evolving a mechanism under which real estate developers and industry bodies such as NAREDCO and CREDAI may be roped in to complete unfinished realty projects. After we arrive at a consensus, the plan will be sent to the state government for approval. Our focus is on delivering as many projects as possible. Also, even when we receive complaints, we first try and ensure that it is settled outside the ambit of the Authority, directly between the builder and the buyer. If projects can be revived and issues resolved through this method, it better be done. This mechanism is being evolved. We have till date resolved 15 to 20 per cent cases outside the authority’s forum, in which people have received settlement. What about the timeframe for resolution of complaints? The expectation is that complaints be addressed within 60 days but it has been taking long because of the backlog of cases. There were 800 cases when we started off. I guarantee that within three to four months we would have evolved a mechanism by which we would be in a position to take decisions on complaints within 60 days. We count 60 days from the time of receiving the application and the process involves scrutinizing the application, returning the application in case more data is required etc. We try and be as complainant friendly as possible. Once we have both the complainant and the respondent across the table, it does not even take 60 days because the issue is settled face-to-face. Many cases have also been decided at the first sitting. In many cases, it has taken us barely 7 to 10 days to give our verdict. Also, initially, if we dispose of cases fast, appeals will happen and it may not be sustainable. It is better to take time to dispose of cases rather them dispose them of quickly. Also, it is expected that cases be decided within 60 days but it is not mandatory. There is no delay on our part where decision making is concerned, delays are procedural delays. We are in the process of appointing an adjudicating officer. We have received nine applications and the government’s go ahead is awaited. An adjudicating official has to be a former district judge and his role is to decide on compensation. Our work has not suffered because of this. People who have asked for compensation, we have kept their rights reserved. As soon as an adjudicating official is appointed, cases pertaining to compensation will be decided. Even if developers have received partial completion/occupation certificates before July 28, 2017, the projects may be exempt from registration but are still under the ambit of the RERA Act. Also, mere filing of OC does not give them exemption. Nowhere does RERA 2016 Act mention that it is applicable only for registered projects. If a buyer finds defects in the structure of a completed unit, he can still approach RERA for redressal. There are three types of projects that are exempted from registration. Projects that are 500 sq m and have less than eight flats; projects where completion certificates have been issued and remodeling projects. These three kinds of projects have been exempted from RERA registration but not exempted from the ambit of the Act. Registration starts at the start of construction and ends at the completion of the project. Once completion certificate is issued, the registration validity automatically expires. But there are certain obligations that the promoter is expected to comply with even after the expiry of registration. These include giving possession of the unit on time, conveyance deed, structural defect liability and workmanship liability for five years, land title liability, complete common facilities, and transfer common areas. Registration or no registration, if there is non-compliance of obligations by the promoter; the consumer can still file a complaint with RERA. Also, the defect liability is valid for five years under RERA. HARERA Gurugram has also ordered that all new projects are to be registered with the authority irrespective of whether the builder is intending to market the real estate after completion of the project or during the construction phase. Even if the builder is selling ready-to-move-in properties, secondary real estate, he is required to provide details of the building he has sold. If you are mentioning in the agreement that the unit is being sold on an as is where is basis, you have to disclose what is as is where is, what is being provided for in the unit etc. Having said this, these provisions will not be applicable to projects that have been delayed by 20 years. There are limitations. Homebuyers who have received possession over three years ago and where vested interests have been finalized, this Act will not disturb the legal relationship between the two parties.